We have outlined the most frequent types of issues patients may run into with their Passport account. Below are the steps to take to tackle these issues depending on whether a patient is going through registration or already actively using Passport. 1. The Patient does not have an email address. 2. The Patient does not have a cell phone number or asks you for the invitation code directly. 3. The Patient never received the invitation email. 4. The Patient received the invitation email but never received the Invitation Code. 5. The Patient wants the invitation sent to a different email. 6. The Patients wants the invitation code sent to a different cell phone number. 8. How can the Patient change the email address for their Passport account? 9. How can I invite a patient whose email address is already being used for another Passport account? 10. The Patient is still having trouble with their Passport account and I have done all I can to help. Unfortunately, a patient cannot sign up for Passport if they are missing an email address. Please advise them on how to set one up; many are free and easy. A patient can sign up for Passport without a cell phone, but the field “Cell phone number used for account authentication” must be filled in order to receive their Invitation Code. If the patient does not have a cell phone, a fake number such as 555-555-5555 can be entered in the field. The 7-digit Invitation Code is usually sent as a text message to the patient's "Mobile" phone number. The Invitation Code can also be found within the "Details" section of the Patient Passport pop-up window. Note: For security purposes, the invitation code changes per invitation you send. So if you re-send an invitation, make sure you give the patient the most updated invitation code in the "Details" section. The patient's email address may not be correct. Please confirm with the patient their email address and resend the invitation email. The Invitation Code is a 7 digit code that sent as a text message to the patient's "Mobile" phone number. The patient's mobile phone number in their chart may not be correct. Please double check (and if necessary, correct) the patient's mobile phone number and resend the invitation email. Please also confirm with the patient that their cell phone plan does not have a feature that blocks certain text messages. If the patient has not yet registered for a Passport account (i.e. the "Passport" bar below their picture will be grey or yellow), you can simply update the email address in the patient's chart, and re-send the invitation to the patient. This updated email will now be the email address associated with their Passport account. Update the cell phone in the patient's chart and re-send the invitation to the patient. Once the patient's mobile number is changed in their chart, it will automatically be changed in their Passport account too. 7. The Patient forgot their password. On the Patient Passport login screen, have the patient click the "Forgot Password?" button. Here they can enter the email address they used to create their Passport account and they will be sent an email to reset their password. Remind the patient their password needs to be 12 characters long with at least one number or special character. To update their email and password, they'll want to click on their name in the upper right corner of the page and select Settings from the dropdown. Once on their settings page, they will see the option to “Change Email” and “Change Password” under the Login and Security section, as seen in the image below. When they click “Change Email”, they will be prompted to enter in their new email address and “Submit Request”. Submitting will trigger a verification email to the new address where they will need to confirm their new login email. Once confirmed, they will be able to login with the new email address. When they click “Change Password”, they will be prompted to enter in their old password, then add a new password and retype it to confirm. Clicking “Update Password” will immediately update their password to the new information and give them a link back to the login page. 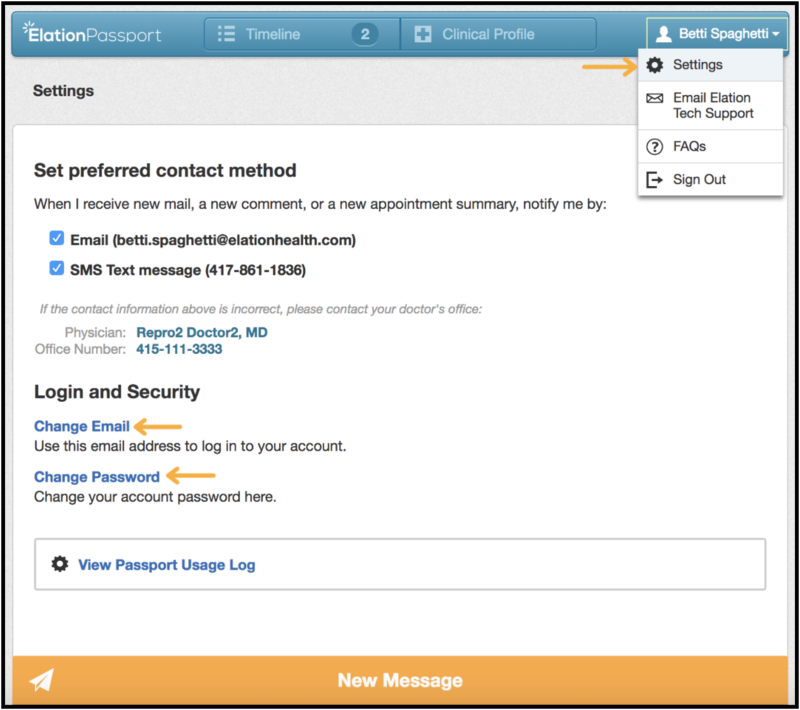 What if my patient can't access their Passport to change their email on their own? If a patient is not able to login to their account and would like to change their email, you will need to update the patient's email address in their Patient Demographics. Once that's done, write in to Elation Support via the "I need help" button and ask them to update the patient's Passport login to match the email listed in their chart.